Winter holidays is my favorite time of the year (after birthday)! It seems like people smiling more often, and enjoying cold weather and upcoming festival! We putting up the Christmas tree and decorating it with beautiful toys, buying and wrapping gifts. It’s the right time to plan the holiday menu, whether to roast chicken or prepare the fish pie, make cherry strudel or chocolate cake.. The December would be incomplete without baking! Nothing says it’s holidays quite like Xmas cookies! There is something special about a tray filled with delicious vanilla or cinnamon-flavored cookies. Baking cookies is such a fun and wonderful event! You can even organize a cookie party, call your kids or friends to help you, to share a holiday mood, and of course to enjoy eating all those treats you’ve made. I bet you’ve seen crescent-shaped cookies somewhere or may be tried it. These biscuits are very popular in Europe, and especially in Germany, where they’re traditionally baked for Christmas, even though they originate from Vienna, Austria. *First, prepare your own vanilla icing sugar. Split vanilla pod lengthwise into two halves, and put it in a jar with icing sugar, close tightly. After 1-2 days you will get amazing naturally-flavoured vanilla icing sugar! For the dough quickly mix butter with sugar, salt and vanilla. Mix in egg yolk. Sift flour and add it to the dough along with almonds. Qucikly knead the smooth dough. Cover with cling wrap and refrigerate for 1-2 hours. Divide the dough and form rolls 1.5-2.5cm in diameter. Cut each roll into 5-6cm length slices, and form the crescent shape biscuits. Put biscuits on a baking tray lined with parchment. Bake in preheated 200C oven for 10-15 minutes. Put vanilla icing sugar in a plate, and roll still warm biscuits in it. Dec4December 4, 2014 • By milkandbun • This entry was posted in Cookies, Festive Cooking and tagged baking, biscuits, Christmas, cookies, cooking, crescent cookies, delicious, DIY, food, food and recipes, food photography, food styling, foodpress, German cookies, holidays, photography, photos, recipe, tradition, vanilla, Vanillekipferl, Xmas, Xmas recipe. Bookmark the permalink. They were superb, and melted in the mouth! 🙂 Thank you for the commenting, Judie! I’ve had these cookies before they are so festive and delicious. Thanks for posting the recipe. One of my dearest friends growing up was German, and i loved Christmas time at her house, especially the cookies. Thanks for the memories, and the cookies recipe! Thanks a lot! Hope both of you will like it! If you want to make not many cookies, you may divide ingredients by half, but keep one egg yolk. 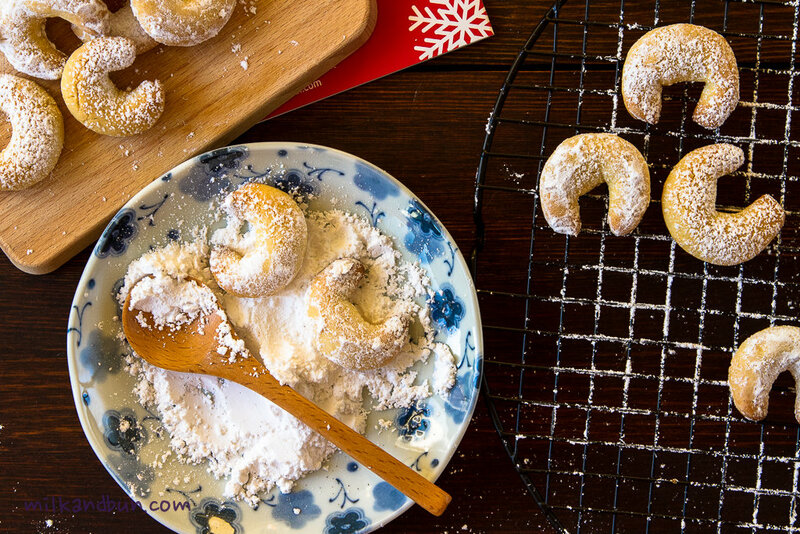 I love Vanillekipferl – Christmas is not Christmas without them!! One of my favorites! I made them with my boys last year for a special school treat. These look wonderful and make me crave Christmas cookies. These are some of my favorites. I also used to eat these almond cookies that had cinnamon on them and shaped like crescent moons. I got them at the Russian bakery. I wonder if these were them, but with cinnamon added. Gorgeous photos. These are my favorites in all world!!!! I love them!!!! Though, I never tried to bake them… maybe I will finally do it this year 😀 yours look amazing! 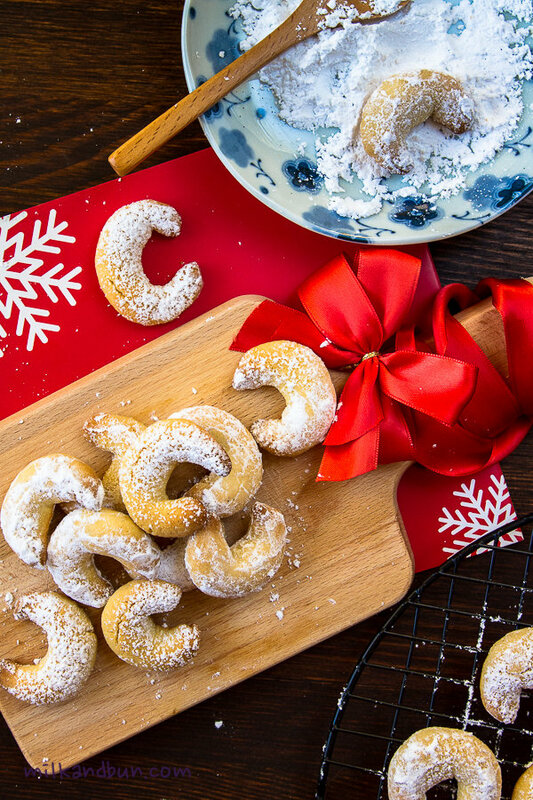 They look just like my mum´s – one of my absolute favorite christmas cookies! Great!